Number 4 Tivoli Buildings is the only one of the four properties to have retained its original use, apart from a short period in the mid 1970s-1980s.. From its opening in the 1870s it has always served as a butcher’s shop originally under the management of Mr J Penstone. It was then taken over by R Challis until the beginning of the 1890s when it transferred to the ownership of F Waghorne. The shop continued under that name until the 1940s. S Gilder had acquired the business by the end of the war and it continued under his management until at least 1975. Between that date and 1987 it was a catering-hire shop run by R&R Catering. 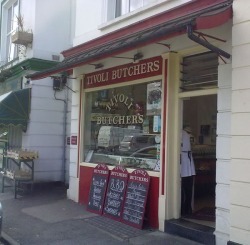 It has been run by Paul Woollins as a high class local family butcher since 1987. When preparing the shop for opening in 1987, Paul found the beautifully engraved marble Waghorne shop front inside the building, but unfortunately it cracked as it was being lifted. 1-4 Tivoli Buildings and 1-3 Tivoli Place brings us to the corner of Tivoli Street. Immediately facing one on the opposite corner is the start of the long terrace of commercial properties that most people identify with Tivoli Place. However, this Terrace has not always been the neat row of attached properties that exist today and its present appearance dates from as recently as 1991.